Walt Disney’s dream for the future of society was one he intended to share with the world. He spent a great deal of his company’s capital as well as his own personal finances in a stealth attempt to acquire land for his utopian dream. You know it as Project X or the Florida Project. You also know it as Walt Disney World. This is the story of how a part of the second gate there fell into disrepair, even as it exemplified one of Walt Disney’s unrealized dreams for Project X. After Disney died, his brother and his Imagineers faced a difficult decision. How could they create the Experimental Prototype Community of Tomorrow without the man who initially envisioned it? One of their bold decisions was to emphasize a hallmark of their founder’s career: innovation. He’d built Tomorrowland in 1955 as a celebration of the Space Age and Googie Architecture. A portion of EPCOT would stand as the enduring proof that his vision had come to fruition. If the Imagineers could honor him appropriately, it would remain a utopia in the heart of Florida, and it would celebrate technology in all forms. Walt Disney wanted to advance the modern world into the future, and his followers attempted to mimic this behavior. Ultimately, they reached a turning point where technology fell out of favor, giving way to commerce. Future World debuted at the same time as the park in 1982. It was the front half of EPCOT Center, the one with all the rides that would provide entertainment for people once they were done with the revolving World’s Fair in the back of the park, the World Showcase. That’s the underlying genius of Epcot even today. The front and back divide cleanly, and each one is endearing in its own way. 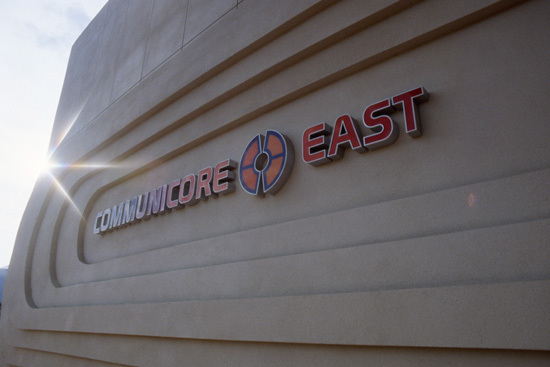 A key part of Future World was CommuniCore. In fact, it stood as the middle of the hub design for EPCOT Center, split into two symmetrical buildings. To maximize the desire for additional knowledge, a foundational goal of Uncle Walt, Epcot park planners positioned the buildings adjacent to other important Future World locations. The purpose of CommuniCore was to reinforce the ideas from the surrounding Future World portals. In order to enhance the knowledge younger audiences would acquire at the Universe of Energy Pavilion, as an example, CommuniCore provided the Energy Exchange, a supplemental educational tool. Many of the activities in the twin buildings were hands-on. In fact, several of them included touch-screen technology, something considered rudimentary today that still stood out as revolutionary as recently as 10 years ago. EPCOT was that far ahead of its time with regards to the available technologies of 1982. Alas, the appeal of CommuniCore waned for predictable reasons. What once seemed like wizardry when Duran Duran ruled the world of pop music already qualified as quaint by the time Kurt Cobain and his band smelled teen spirit. Compact cassette tapes were just beginning to overtake vinyl when EPCOT Center debuted. The world was ready to move on to the digital era of compact discs by the start of the 1990s. Disney experienced the curse of Moore’s Law expanded into all realms of science. They learned that building a lab of the future can quickly become a pointless endeavor. The giant computer processor lab Disney unveiled at CommuniCore missed something obvious. Technology would grow smaller as it grew faster. Their massive computer lab looked ridiculous after only a few years. And that wasn’t even factoring in the absurd Astuter Computer Review, the first Epcot attraction to close. 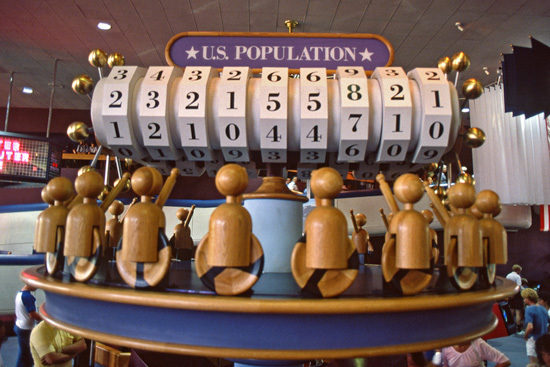 Disney embraced optimism across Future World. What they dramatically miscalculated was how quickly technology was going to change. A dozen years after Future World and CommuniCore opened to the public, Disney’s park planners chose to reboot their failed CommuniCore concept as Innoventions. Rather than predict the world of tomorrow poorly, Disney would celebrate some of the most noteworthy inventions since the inception of Epcot, the truly innovative ones. So, they combined the two words, inventions and innovations, into Innoventions. Gone were silly premises like SMRT-1. In their place came much more corporate endeavors, presumably because the 1990s version of Disney run by Michael Eisner was extremely budget-conscious. He loved the idea of adding attractions that sponsors paid Disney to host. Companies such as Apple, General Electric, General Motors, and Honeywell all ponied up to have Disney guests thinking about their products while on vacation. I remember the Sega space being absolutely packed. It wasn't a failure. Kids loved it and would play in there for hours at a time in an otherwise boring park.